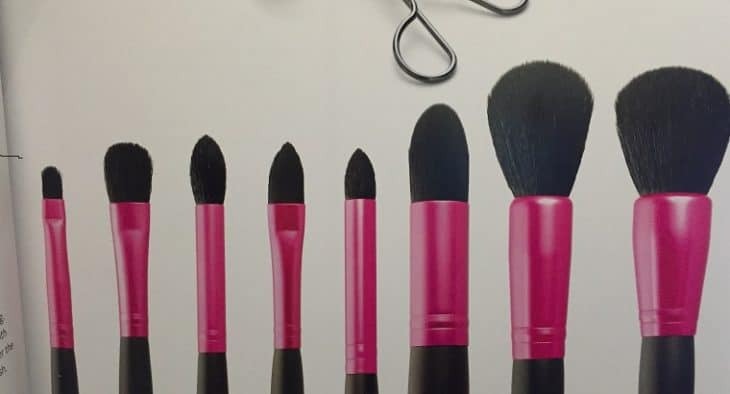 To many people owning 10 plus makeup brushes may seem like overkill, however makeup lovers know very well that numerous brushes are needed to accomplish specific looks/effects with your make up. Investing in great makeup tools is essential to anybody wishing to take their makeup game to the next level. The following are 13 essential items needed for any makeup kit. 1) Lipstick/Brow/Creme eye shadow brush: This is a square tipped brush that is quite dense and made with nylon bristles that is stiff enough to create the precise line needed. 2) Powder eye-shadow brush: A medium sized brush no bigger that the size of your eyelid that is used to pack color onto the eyelid. This is brush is dense but soft and is made with 100% natural hair. 3) Eye-shadow Blending Brush: This brush is usually pointed for easy contact contact with the eye socket. Its soft bristles and shape are perfect for blending eye-shadow edges and diffusing color on the lid. 4) Concealer Brush: This is a flat pointed brush made with synthetic bristles to fit perfectly under the eye area. You can also use it when applying creme eye-shadow. 5) Foundation Brush: A foundation brush is essential for flawless application. The brush can be a round dense kabuki or a flat pointed one. The kabuki is better with the blending of the foundation while the flat pointed one allows for the precision application in tight areas. 6) Beauty Sponge: More recently, a beauty sponge most commonly referred to a beauty blender (http://www.beautyblender.com/) , is fast becoming the most must have item in your makeup kit. This round, soft, sponge makeup applicator blends foundation/contour flawlessly with the most seamless finish and least amount of effort. Always remember to dampen the sponge a little before you begin. 7) Blush/contour Brush: A blush brush is gently curved with medium density and long bristles. Its gently rounded tip fits perfectly into the hollows of your cheeks and temples. This brush allows a streak free application of your powder blush and contour. 8) Powder/Bronzer Brush: The powder brush is the largest and is made with 100% natural hair. It is perfect for applying face powder or bronzer and makes blending easy. 9) Eyebrow Brush: Tidy wayward eyebrow hairs with an eyebrow brush/comb. This helps with the sculpting stage when filling brows in. 10) Sharpener: A good quality sharpener is essential to any kit as it keep lip and eye pencils sharp. Get one with 2 openings, one for regular sized pencils as well as the crayon size. 11) Lash curler: A curler is used to make lashes appear longer and gives a more wide-eyed look. 12) Q-Tips: Q-tips help clean up smudges and mistakes with eyeliner and lips pencils. Dip the tip in some foundation or concealer first maintain that seamless finish. 13) Tweezers: Keep tweezers on hand to pluck out any out of place hairs.